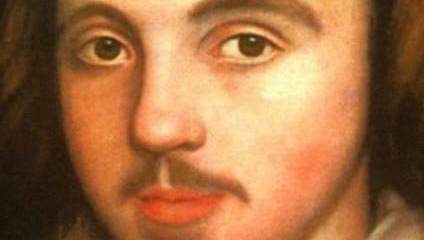 Marlowe’s life was almost as spectacular as his plays. Born in 1564, this notorious dandy was dubbed a “tobacco-user”, “counterfeiter” and “rakehell” and widely accounted to be a government spy. There’s a brilliant man strutting his stuff on the Southbank this summer. He’s a shrewd, witty Brit who swoops through time and space uncovering evil and rewarding virtue; however, he is eternally condemned to dwell in the shadow of his travelling companion, an eloquent magician of universal renown. No, I’m not talking about Arthur Darvill, who stars as Mephistopheles in Matthew Dunster’s new production of Doctor Faustus at the Globe - and just so happens to also play Rory, humble sidekick to Matt Smith’s barnstorming Doctor Who, on the BBC. I’m actually referring to Christopher Marlowe, the enigmatic Elizabethan writer who penned the play about Faustus’s devilish pact. You know, Marlowe. The one who isn’t Shakespeare. There is such as glut of great Shakespeare in London - this year alone you’d be mad to miss Tate and Tennant’s sparkling Much Ado or Kevin Spacey’s iconic Richard III - that can be easy to feel that your annual quota of worthy blank verse has been amply filled by Bill. But, as Dunster’s fast, funny production shows, the big bard’s contemporaries are worth seeking out. Marlowe, Ben Jonson, Thomas Kyd, Philip Massinger, Francis Beaumont and John Fletcher all produced works full of humour and wisdom, beautiful language and ferocious action, and they retain the advantage of still having something fresh to offer to theatregoers who have been saturated in Shakespeare since their schooldays. Marlowe’s life was almost as spectacular as his plays. Born in 1564, the same year as the Stratford glover’s son, this notorious dandy was dubbed a “tobacco-user”, “counterfeiter” and “rakehell” and widely accounted to be a government spy. His critique of the Bible led to charges of heresy that were abruptly concluded when he was murdered in a lodging house in Deptford. His most famous plays - Faustus, Tamburlaine and the Jew of Malta – demonstrate his ability to make epic and exotic history come to life in a sensuous, thrilling way. These three blockbusters were written to showcase the talents of Edward Alleyn, the tall and haughty star actor of the Admiral’s Men theatre company, and they still offer meaty, vivid parts for an actor who can reach into the darkest parts of his soul while executing verbal and physical fireworks. Nail the casting and you’re in for a treat. Jonson is the true Londoner’s playwright. While his colleagues crafted tales of ancient times and foreign shores, he mocked the ordinary people around him in the city where he lived and worked. Born to a poor widow and educated in Westminster, Jonson also became an actor and writer for the Admiral’s Men. His reputation as a troublemaker flourished via brawls both physical - murdering another actor in a duel in Hoxton, and literary – producing vicious satires about rival companies. The Alchemist, a frenetic farce featuring a band of con artists duping the great and gruesome of their money, is probably his best-known play and establishes his pet themes of greed and gullibility. But my favourite is Bartholomew Fayre, an account of the notoriously debauched Charter Fair that took place in Smithfield every year from 1133 to 1855. It captures the savage, bawdy bustle of Elizabethan London as well as any CGI film, and it is eerily easy to find modern parallels with his cast of poor artists and whores, gold-diggers and Puritans. Hamlet is a version of the classic revenge tragedy popular at the time, and Thomas Kyd was the master of this lurid, gothic genre, as evinced in his play The Spanish Tragedy (mid-1580s), which features murder, suicide, madness and ghosts. Thirty years his junior, John Webster evolved the form into dark political tales such as The White Devil and The Duchess of Malfi. As with most established genres, Shakespeare treated the revenge tragedy with an ironic ambiguity, subverting and supplanting its elements like a theatrical DJ; with Kyd and Webster you get the full mad monty, drenched in blood and superstition. Getting to know Shakespeare’s associates brings a satisfying and illuminating sense of the interconnections between writers, actors and plays. What now can seem somewhat inaccessible works were then highly competitive crowd-pleasers, which were constantly incorporating, rejecting and overturning the literary and dramatic influences of the time. Behind those ‘classic playwrights’ lies a vital, unruly band of men closely tied together by professional ambition as well as personal alliances and grudges. They regularly collaborated on and adapted each other’s plays; Kyd shared a room with Marlowe (and, under torture, gave evidence against him for heresy); Shakespeare acted in Every Man In His Humour, the play that turned out to be Jonson’s first big success. Evidence of their lives is scattered across London, from Kyd’s record of baptism in the church of St Mary Woolnoth in Lombard Street, to Marlowe’s unmarked grave in the churchyard of St Nicholas in Deptford. Obviously, Shakespeare still gets the best and biggest gigs in town, but if you get the chance to catch a play from one of his overshadowed contemporaries, go. After all, everyone adores Doctor Who; but the most discerning fans have a secret passion for Rory.